We had our December Mommy and Me Book Club session yesterday and it turned out great. The book was just one that we had around the house that my son liked. It is called Frosty's New Friends and it is by Richard Cowdrey. The main reason I chose it was because it had lots of pictures, a very basic storyline, and pretty simple words. Our group ranged in age from 2-5 today, so I wanted to make sure to keep the attention of the younger kids. - Snowman puzzles from Confessions of a Homeschooler. 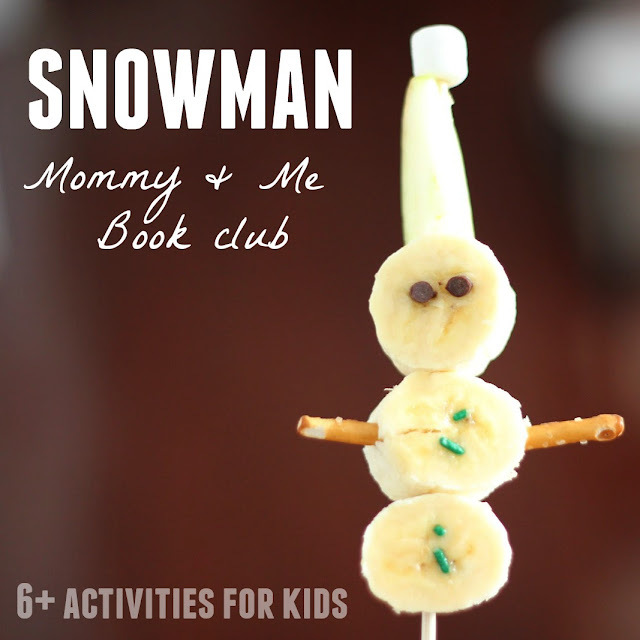 Snack: Snowman on a stick (make sure to cut the tips of the skewers... they are sharp! We learned that the hard way). We mostly just used ingredients we had around the house- bananas, pretzels, mini-chocolate chips, apples, marshmallows, and sprinkles. We investigated the M&M patterns... and snuck some treats too. - Snowball making and throwing: The kids made snowballs out of paper, tried to aim and throw them into baskets, and then played "catch the snowball" with a partner. - Muffin Wrapper Snowmen- I loved the variations. I didn't give them a model, so each one was different. I had fun creating my own during naptime because they looked like so much fun to make! - Goodbye song and then it was playtime while the moms got to chat! Do you have a favorite snowman craft or activity? I would love to share it as part of a snowman round up I am doing in January... so put the link in the comments. How cute is your banana snowman!!! We are definitely having a snowball fight with crumpled up paper. Brilliant! these are fabulous ideas! pinning now! What fun! I love all these activities!